Oh my goodness I think that I may be melting! I hope you all have enjoyed today's blistering heat (with air conditioning and ice cream!) I thought that in response to this summer weather I should move away from autumnal colours and try something summery. "Wow Claire, is this a new punch I haven't seen before?" I hear you ask. No, it's the the Fancy Flower punch from the main catalogue masquerading as a sunflower. 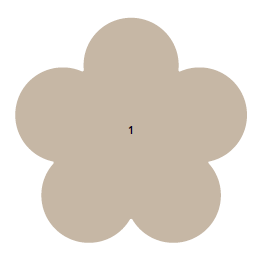 The punched image normally looks like the picture to the right, but by punching the card once and then punching into the petals (putting the points in the middle of the petals and punching again) you get this lovely flower. I thought that it looked like a sunflower, and I had been looking for an excuse to use the gorgeous More Mustard card stock so this seemed ideal. 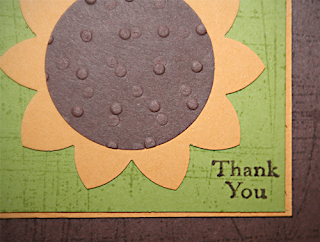 Once I started thinking about it I came up with the idea of using the Perfect Polka dots embossing folder from the mini catalogue to simulate the seeds in the middle of the sunflower. I tried putting it through the Big Shot twice to increase the density of the dots but it didn't work, think I might have to have a play with that. 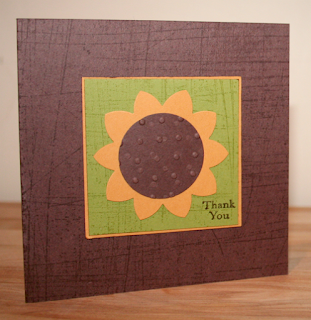 Pear Pizzazz is one of my favourite colours and I thought that it gave the card a summery garden feel with the Early Espresso providing quite a neutral grounding effect. Finally the sentiments from Silhouette Sentiments completed the card. I LOVE these sentiments, they are so small and subtle I find myself using them all the time. Best of all these are a level 1 hostess gift so you can get a set absolutely free by having a party or placing an order. I hope you like this card, I really surprised myself with it, so not my normal style. Hoping to hear from you soon, don't forget the extra hostess benefits this month and next!